If you’re looking for the ultimate, high-tech baby swing, the 4moms mamaRoo Baby Swing won’t disappoint. It comes with five motions that were designed to replicate parents’ natural movements. The seat is also adjustable and has a removable and machine washable cover that comes in two different fabric options. With the option to control settings remotely via Bluetooth on your smartphone, the 4moms mamaRoo delivers with tons of fun features for you and your baby. 1 SAFETY | Used in Hospitals Nationwide! A sleek design and high-tech features make the 4moms mamaRoo Baby Swing a great baby swing for modern families. SAFETY | Used in Hospitals Nationwide! Safety is not an afterthought with the 4moms mamaRoo Baby Swing. This swing comes with a three-point harness that keeps baby strapped in. In addition, there are a few accessories that help provide additional safety, like the infant insert for small babies. This allows for proper head and body support. If you don’t choose to buy the infant insert, just make sure that baby’s head is properly supported. The weight limit ranges are fair with the mamaRoo, with a minimum weight of 5 pounds and maximum of 25 pounds. A statement from 4moms also guides parents to discontinue use if baby can sit up unassisted or attempts to climb out. Whichever milestone comes first (weight limit or escape attempts) needs to be noticed and the mommaRoo needs to be retired for this baby. A complaint of the 4moms mamaRoo Baby Swing seems to be that the seat is too shallow making it easier for baby to scoot down too far. Therefore, this safety point helps to reinforce that the harness should be used at all times. 4moms has a program called “4moms Cares” that collaborates with children and families, hospitals, and the community to provide donations and hospital discounts. 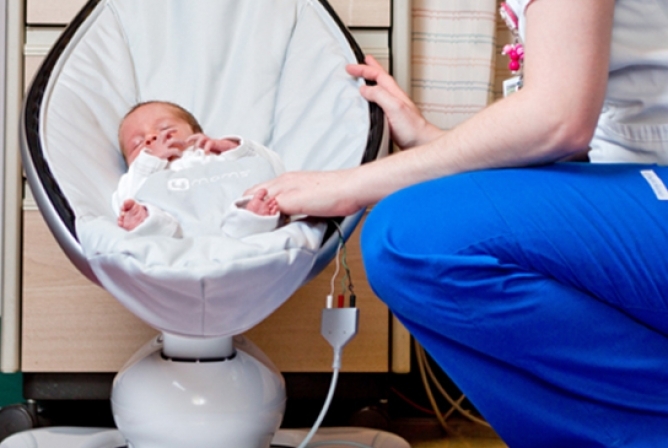 The mamaRoo is used in hundreds of hospitals to comfort sick babies. Many nurses and doctors swear by its effectiveness and safety. “The mamaRoo is calming because it provides an environment that is similar to still being in utero – babies feel contained, they’re moving, there’s a bit of sound – and we find that very soothing for our babies,” – Alan Lantzy, MD; Neonatologist and Pediatrician. Think about how safe the mamaRoo must be if it’s used in hospitals nationwide! Five unique motions make the 4moms mamaRoo Baby Swing a special and high-tech device to comfort your baby. 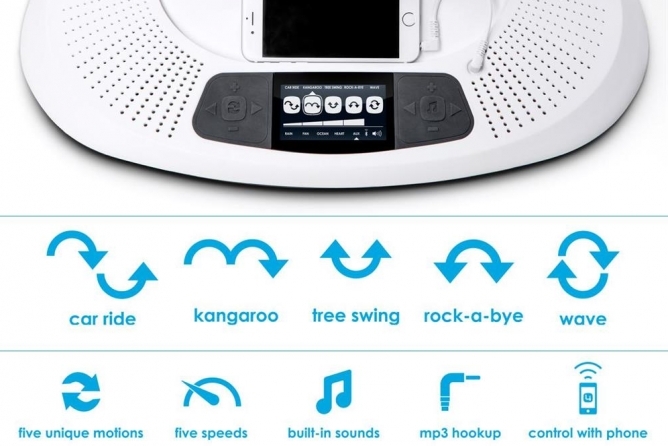 Car ride, kangaroo, tree swing, rock-a-bye, and wave motion settings provide quite the number of options along with the ability to change speeds with each motion. The motions were hand-picked and designed to replicate parents’ natural movements. 4moms literally put vests on parents to study and replicate their motions for ultimate baby comfort. The motions were hand-picked and designed to replicate parents’ natural movements. Due to the fact that these different movements originate from the base, some of the motions can be jarring at times especially when the swing is being started from a complete stop…not a good feature if you have a sleeping baby just placed into this swing. Also, it has been mentioned that the movements are too mechanical to comfort baby, but this might be to user (baby’s) preference. On the plus side, there is a small noise that originates from the motor while the mamaRoo is moving. This provides white noise that can be extremely comforting to babies. The 4moms mamaRoo Baby Swing seat adjusts and reclines from a horizontal position to 47 degrees. This provides quite the range of adjustment for baby’s comfort. Also, a toy mobile is also included and comes with reversible and removable toy balls. The mobile can be moved out of the way if you need to place baby in the seat. Some users have claimed that the mobile is right in baby’s face making it annoying or overstimulating to some babies. However, the fact that you can move it out of the way (or remove it from the entire swing) is a plus. If you’re looking for an easy use seat, 4moms has revamped this seat due to suggestions by customers. Two different fabric covers are available for the 4moms mamaRoo Baby Swing, classic or plush. The classic fabric has a smooth woven surface while the plush is more of a soft and velvety surface. Both classic and plush fabrics are easy to remove and are machine washable. 4moms has revamped this seat due to suggestions by customers. Speed settings have been improved, and now have up to 50% more speed compared to the older model. Settings like speed, music, and motion can either be controlled manually next to the LCD screen on the base, but are small and hard to see. This can be a problem if you have a sleeping baby and are trying to start up the 4moms mamaRoo Baby Swing. It’s as easy as pressing the wrong button and all your hard work goes out the window. This can be easily fixed by downloading the free app on your iPhone or Android where you can control all of these settings by Bluetooth. If you need any technical support, visit the 4moms support website. 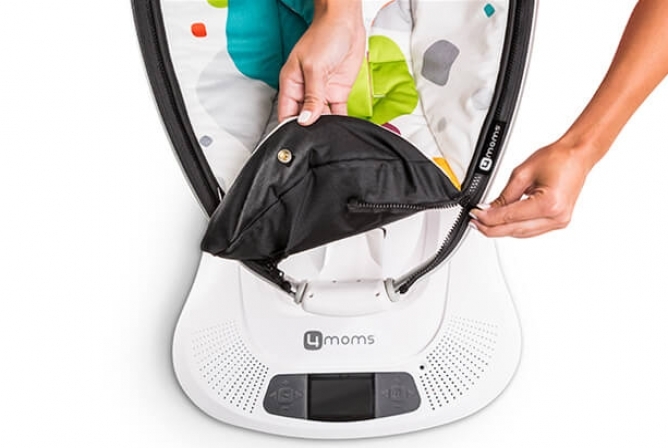 The 4moms mamaRoo has a nice small footprint at 400 square inches. It won’t take up as much room as traditional baby swings or seats and won’t take you out by the knees if you get in its way. At 33 inches long, 19.5 inches wide, and 25.5 inches tall, this is a compact little infant seat. As a result, it’s easy to carry around as it only weighs 19 pounds. Another great feature is the 4.5 LCD viewing screen on the base to view and change settings. The 4moms mommaRoo has a nice small footprint at 400 square inches. Keep in mind that the small size comes with a smaller weight limit. The maximum weight limit is 25 pounds. Going any bigger could be a safety concern and cause your expensive little infant seat to malfunction. Here’s where the fun technology comes into play. Four different noises are included with this seat. An MP3 connector cord also comes with the 4moms mamaRoo Baby Swing allowing you to plug in your phone for more personalized white noise or music. Bluetooth can also be connected using your smartphone and the 4moms app to control the settings remotely on the mamaRoo. 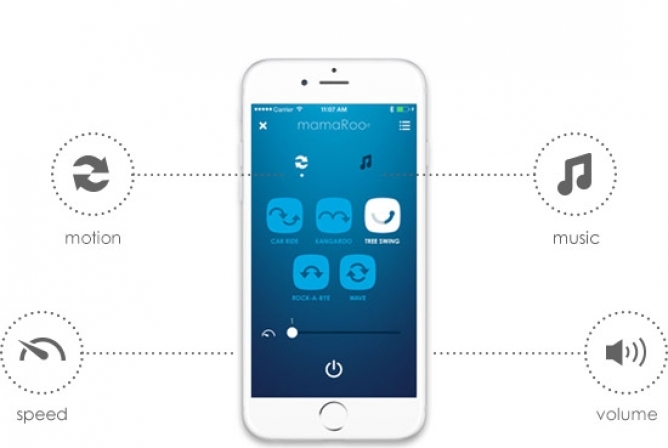 Bluetooth can…control the settings remotely on the mamaRoo. One downside with many baby swings is that they run on batteries which can be a huge money pit. This is not the case with the 4moms mamaRoo because it plugs into the wall. However, unless you have a long extension cord, it can’t be used far from an electrical outlet. 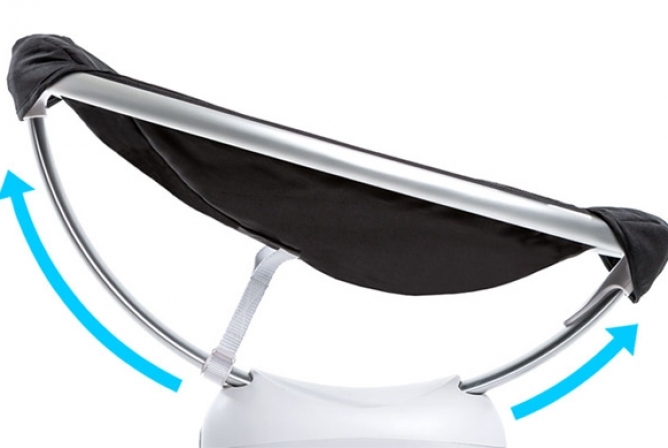 The 4moms mamaRoo Baby Swing has an automatic shut off function after a few hours. Forgetting the settings after the auto-shutoff is a downside to this feature. This means you have to go back in and reset everything when you want to turn it back on which can get annoying after doing it many times per day. Lifetime use is not a great feature of the 4moms mamaRoo Baby Swing. With a weight limit of 5-25 pounds, this makes it useful for around six months. Babies can easily outgrow or get bored with this seat as they get older and more curious. Nevertheless, if you have a baby that needs to constantly be held, sometimes a few moments of rest for both of you is priceless. The mamaRoo could help you get some much-needed rest or get things done around the house. …if you have a baby that needs to constantly be held, sometimes a few moments of rest for both of you is priceless. A couple other great points that help with longevity are that the mamaRoo comes with accessories like inserts and different fabric covers. There are also replacement parts available if anything decides to break or malfunction. A one-year warranty comes with the 4moms mamaRoo when it is bought new. Keep this in mind and read through the warranty before you start using it. Although the 4moms mamaRoo has a higher price tag (Check Price Now! ), it comes with many great features that you won’t find with other baby swings or bouncers. The 5 unique and parent-replicated movements are hard to find anywhere else and could help you and your baby get some much-needed sleep. That’s something many parents would pay a lot of money for! 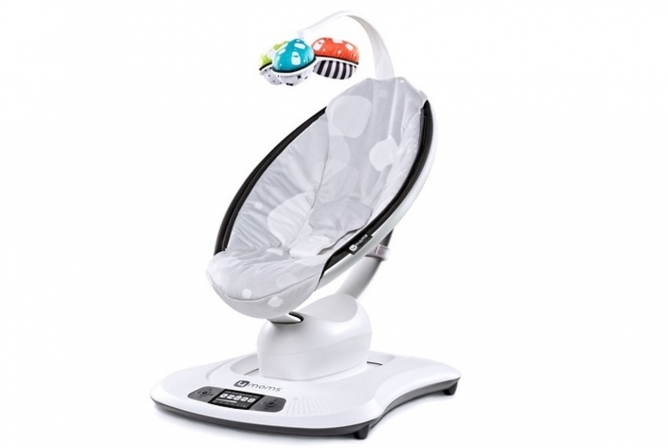 In addition, you also receive some awesome high-tech features that make using the mamaRoo that much easier. Whether you are buying for yourself or someone else, always make sure to keep a receipt or gift receipt. This unit is on the expensive side and it would be horrible to bring it home and not have your baby like it…some babies are picky! While one baby could love the mamaRoo, another could totally love a traditional baby swing or bouncer. It’s all part of the game of parenting! So, keeping that receipt will make your life a lot easier if you decide to return the 4moms mamaRoo for any reason. 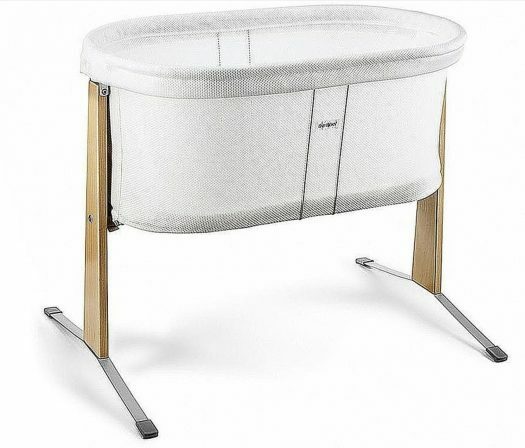 This little infant seat is made for the sole purpose of comforting your baby and helping everyone get some much-needed rest. Most of all, the 4moms mamaRoo Baby Swing was specifically tailored to help relax your baby with the 5 unique and parent-replicated settings. Not many baby swings or bouncers on the market can boast that! The fact that this little seat is used in hundreds of hospitals across the nation shows how reliable, safe, and effective it can be. When considering the 4moms mamaRoo Baby Swing, make sure that your home is compatible, like owning a smartphone (although not required for use) and having safe electrical outlets. Accessories and inserts help with easy use and provide more comfort to your baby. All-in-all, the 4moms mamaRoo is a great investment for those picky babies and boasts many features that help make life that much easier as a new parent.